The magnificent Domaine de Chevalier is at the top of Bordeaux's greatest Crus Classés. Like a secret garden, this emblematic vintage of the Pessac-Léognan appellation is located in a green setting south of Bordeaux. The elements of domain, terroir, and vineyard are inextricably linked to forge the identity of Domaine de Chevalier. The Domaine de Chevalier has been owned by the Bernard family since 1983. It watches over a rare vineyard of 45 hectares with 40 hectares of red vines and 5 hectares of white vines. Olivier Bernard, the estate’s manager, reminds us "Only a great terroir can produce a great wine". In a mosaic of terroirs, Domaine de Chevalier's vineyard grows in black sand and fine white gravel that rests on a perfectly drained clay-gravel subsoil. With a philosophy centred on revealing the most beautiful expression of this exceptional terroir, Cabernet Sauvignon (63%) dominates the estate’s vines with Merlot (30%), Petit Verdot (5%) and Cabernet Franc (2%) making up the remaining vines. Bordeaux's emblematic white grape variety, Sauvignon Blanc, represents 70% of the area dedicated to white vines. The other 30% is dedicated to Sémillon. Great attention is paid to every step in the vineyard and in the winery from extremely precise plot classification to masterful vinification techniques. The wines from Domain de Chevalier continue to be the most beautiful benchmarks in the region of Bordeaux year after year. The Domaine de Chevalier Rouge is an emblematic wine from the estate. It is distinguished by its exceptional aromatic complexity. The ultra-fragrant bouquet combines the fruity character of Cabernet Sauvignon and the smokiness from the gravel, which is typical of the appellation. The palate is enveloped in a beautifully structured, silky mouthfeel with well-integrated tannins. All of this helps reveal the brilliant, mellow fruit. 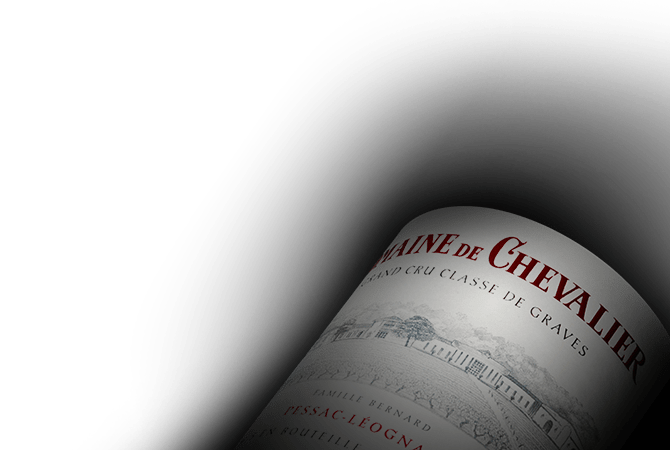 The Domaine de Chevalier Rouge will express all of its splendour through blossoming over the years while keeping its balance and fruit freshness. The Domaine de Chevalier Blanc has a style that is unique among the best Pessac-Léognan wines, and is recognised as one of the world's finest dry white wines. With class and refinement, the whites have an intensely expressive aromatic bouquet that reveal delicate white fruit notes along with elegant floral notes. The bouquet then evolves into smoky notes, which recalls the minerality of the terroir. The mouthfeel is ample and generous with a smooth texture. There is also a great aromatic concentration, as well as a richness that does not take away any freshness or crunchiness of the fruit. The finish has a breathtakingly persistent length that offers minerality and purity.